Hi everyone! 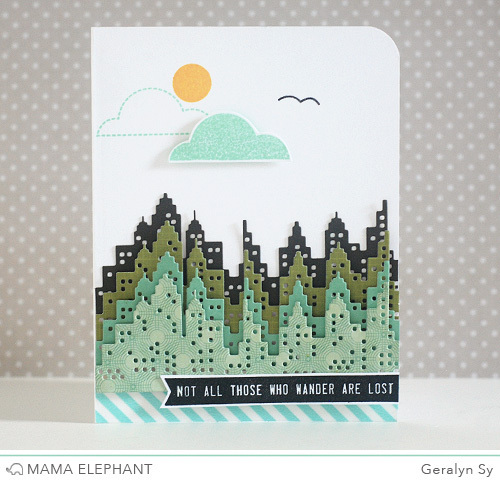 Geralyn here today with a card I made using the new Cityscape Creative Cut. I love this new metal die and can definitely see myself using it a lot for both scrapbooking and cards! 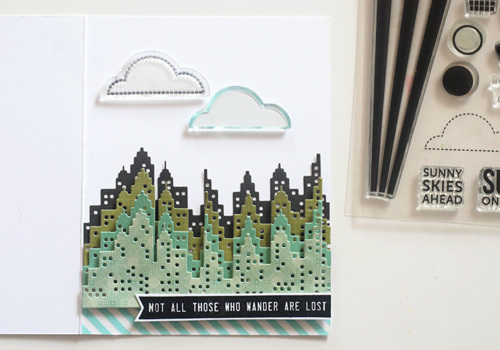 Today I'll show you how I used it to create a sort of ombre cityscape scene for my card. 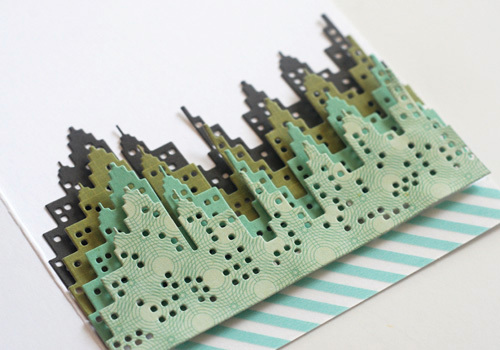 I started by cutting out several cityscape die-cuts from various patterned papers. I laid them on top of each other, from darkest to lightest, and adhered each layer with foam adhesive. I love how the foam adhesive adds a lot of dimension to the card. The bottom stripe is just a strip of washi tape. I added the stamped banner to the bottom as my sentiment. It's from the Wanderlust set. To finish off the card, I wanted to decorate the sky a little with some clouds so I used the Sunny Skies set. Here's my finished card! I kept it quite simple but the dimension from the cityscapes adds a lot of impact. Thanks for visiting today! I can't wait to see what you all do with the Cityscape Creative Cut! Gorgeous card!! Love the ombré city scape!! Stunning!! wow what a stunning effect layering of the cityscape die has on this card! Lovely card! I love it! This is a fabulous card! Love it! Gorgeous card, Geralyn! I just received mine in the mail, and I can't wait to play with it! Fantastic card. I love the stacked die cuts. WOW - the colours & layers look STUNNING!!! WOW! Super city scape card!